Info Asa Smith Bushnell, governor of Ohio from 1896 to 1900, was a Springfield businessman who was identified with the Foraker wing of the Republican party. Born in 1834 into an old New England family in Rome, New York, he came to Ohio at the age of eleven. Bushnell's father, Daniel, was an active worker on the Underground Railroad, and a cousin, Simeon Bushnell, was imprisoned for his part in the Oberlin-Wellington rescue case. The future governor, however, seems to have been more interested in acquisitive enterprise than in antislavery agitation. He separated from his family at an early age, obtained a scant education in the public schools of Cincinnati, and, at seventeen, was supporting himself as a dry goods clerk in Springfield. Three years later he had risen to the more remunerative position of bookkeeper in a prominent business firm, and, following his marriage in 1857 to Miss Ellen Ludlow, he became a partner in his father-in-law's drug store. Bushnell's business career was briefly interrupted in the summer of 1864. when he served as captain of a "hundred-day company" of infantry assigned to guard and picket duty in the Shenandoah Valley. Several years after the war he acquired a partnership in a concern which manufactured reapers and mowers. At this time Springfield was a center of the agricultural implement industry. Bushnell's firm flourished, and his holding in it was the principal source of his large fortune. During his later years, he was president not only of the implement company but also of the First National Bank of Springfield and of the Springfield Gas Company. He was also prominently connected with the street railway and telephone companies of the city. Bushnell's first important political assignment came in 1885 when, as chairman of the Republican state executive committee, he managed the successful gubernatorial campaign of Joseph Benson Foraker. His own nomination as Republican candidate for governor in 1895 was obtained through the support of Foraker and George B. Cox, the political boss of Cincinnati, and against the opposition of the forces of John Sherman and Mark Hanna. 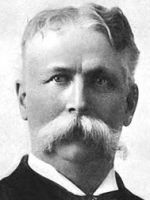 In the ensuing campaign Bushnell defeated his Democratic opponent, James E. Campbell, by over 90,000 votes. The first order of business in Bushnell's administration was the election of Foraker to the United States Senate. Foraker's influence remained strong throughout both of Bushnell's terms as governor. In 1896 the senator-elect secured the passage by the Ohio General Assembly of the notorious Rogers Law which permitted Cincinnati officials to grant a fifty-year extension of its franchise to the Cincinnati Street Railway Company. Senator Foraker later represented the transit firm before Governor Bushnell and the state board of tax remission and succeeded in winning a $285,000 reduction in the company's tax valuation. In 1897 the elevation of John Sherman from his seat in the United States Senate to the post of secretary of state in President McKinley's cabinet presented Bushnell with a difficult decision. It was the governor's responsibility to name the person to fill the unexpired portion of Sherman's term. Mark Hanna was an avowed and determined candidate for the appointment, but Bushnell, a Foraker adherent and a long-time foe of Hanna in the state organization, was reluctant to give him the commission. Nevertheless he realized that a break with the national administration would be politically inexpedient. He delayed naming Hanna as long as possible, yielding at last when both the president and Boss Cox had signified their desire to have the appointment go to Hanna. At the Republican state convention in 1897 Bushnell was re- nominated, but, with the accession of Cox to the Hanna camp, the state party machinery passed to the control of Hanna. In the campaign of 1897 the election of a legislature which could be relied on to send the Clevelander to a full term in the senate seems to have been a more important goal of the party organization than the return of Bushnell to the statehouse. Bushnell was reelected, but by a much narrower margin of victory than in 1895. When the legislature assembled early in 1898, he supported the anti-Hanna group in a bitter but fruitless effort to prevent the election of Hanna to the senate. Like Foraker and Secretary of War Russell A. Alger, with whom he was also on friendly terms, Bushnell was an advocate of intervention in Cuba. Even before the declaration of war with Spain in April 1898, he authorized the adjutant general to purchase sufficient stores of equip- ment to place Ohio's military establishment on a war footing; in the absence of legislative authorization for the expenditures, Bushnell gave his personal guarantee of payment for the purchases. He issued orders for the mobilization of the state's armed forces immediately upon receipt of the first presidential call and, in his annual message noted with pride that "Ohio was the first State in the Union to put a volunteer regiment in the field." Despite or possibly because of the factional strife that characterized it, Bushnell's administration saw the enactment of legislation of consider- able significance. Acting on the governor's recommendation, the general assembly adopted laws levying excise taxes on public utility companies and certain other corporations. The increased revenues obtained from these measures led to the further development of corporation taxation in succeeding administrations and to the eventual abandonment of the direct property tax as a source of revenue for the state government. Bushnell's attorney general, Frank S. Monnett, renewed the legal attack on the Standard Oil Company which one of his predecessors had begun some years earlier. Monnett also assisted Senator H. E. Valentine in the investigation of trust problems undertaken by a com- mittee of the state senate in 1898. As a result of this inquiry the legislature enacted the Valentine Act which defined and prohibited various trust practices and specified criminal penalties for violations of the law. Among the more notable achievements of the Bushnell administra- tion were several pieces of social legislation which gave state authorities more power to regulate the employment and hours of work of minors in factories and mines, improved the working conditions of women in factories, and imposed sanitary standards for bakeries. The general assembly also passed bills substituting electrocution for hanging in the execution of the death sentence, regulating the practice of medicine in the state through the establishment of a board of medical registration and qualification, and authorizing the erection of the judiciary annex to the statehouse. Governor Bushnell took a keen interest in the planning and construction of this building, the cornerstone of which was laid in 1899.